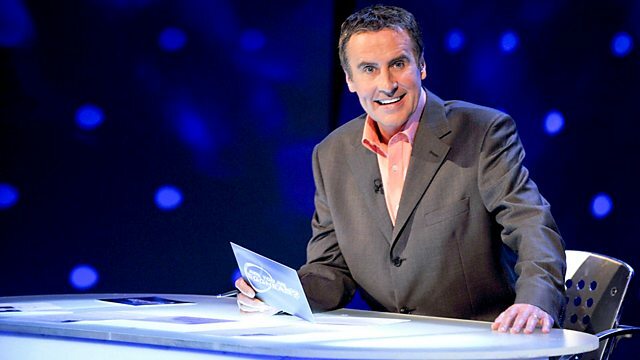 Dermot Murnaghan hosts the quiz show. Can a team from Doctor Who featuring Colin Baker, Katy Manning, Frazer Hines, Louise Jameson and John Leeson triumph over the Eggheads? Dermot Murnaghan hosts a celebrity special of the show where every day a new team of challengers take on probably the greatest quiz team in Britain. The Eggheads are made up of some of the country's top quiz champions, including Mastermind Champion of Champions Pat Gibson, Are You An Egghead? winner Barry Simmons, Millionaire winner Judith Keppel, International Mastermind winner Chris Hughes and four times world quiz champion Kevin Ashman. Can a team from Doctor Who featuring Colin Baker, Katy Manning, Frazer Hines, Louise Jameson and John Leeson triumph over the general knowledge Goliaths and win the cash prize for their charity or will it go to the Children in Need appeal? Adventures in Space and Time, on the Doctor Who official site.